The Tellenes Wind Farm is located in the region surrounding the ilmenite mines at Tellenes in the municipalities of Sokndal and Lund in Norway. The construction of Tellenes Wind Farm began during the summer of 2016, and is expected to finish in autumn 2017. The wind farm will consist of 50 turbines, delivered by Siemens, which will generate a total installed effect of around 160MW. It is estimated that the wind farm will annually produce approximately 520GWh, equating to the electric consumption of around 25.000 Norwegian households. During June 2016 the project was acquired by the American company Blackrock, and it was further decided to increase investment into the project. A long-term supply contract has also been entered into with Google. The final closing of Tellenes Wind Farm took place in London end of June 2016. Zephyr and Norsk Vind Energi, together with Google and BlackRock announced that Google will buy all the production from the wind farm, for the next twelve years, starting September 2017. 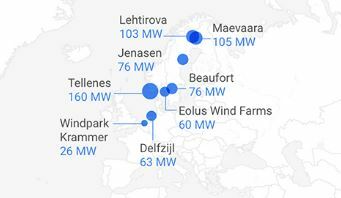 Google, which has four European data centers in Finland, Belgium, the Netherlands and Ireland, said the wind power will be used to supply one or several of them.